I’m a little embarrassed to admit how excited I was to finally sharpen some of my chef’s knives this weekend. More specifically, I was really excited upon using the first one I sharpened, a crappy santoku that was part of one of those newlywed starter kits, with steak knives and everything. Making a brunch hash Saturday, that santoku plowed through an onion like I haven’t done in ages. 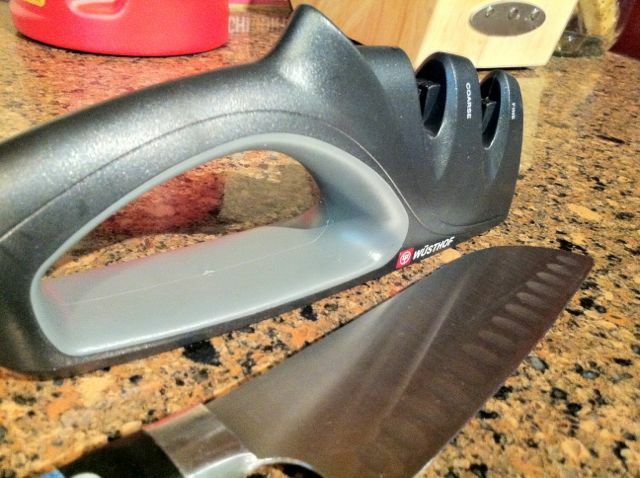 Wüsthof two-stage knife sharpener I just bought at Kreb’s, and the crappy santoku it resurrected. I haven’t even gotten to my better-quality knives yet, including the ones that were issued to me in culinary school. I’m pretty sure that is going to be life-changing. Chefs and beautiful knives go together like peanut butter and jelly. Although they aren’t for food preparation, I do find Hand Forged Knives to be a thing of beauty. The cobbler has no shoes. And the chef, very often, has no sharp knife. So, I’ve come to the conclusion that, no matter how you get to it, a sharp knife is a sharp knife. And to be an effective cook, either in a professional kitchen or at home, that’s what you need. It’s really almost all you need. A draw-through sharpener. This is what I finally purchased that got things going. I bought a two-stage model by Wüsthof for about $20, but I’ve also had a tiny version with just one stage that worked pretty well. I can’t find it right now, hence the new purchase. (Time to clean the gadget drawers.) This and its electric cousin below generally grind off miscreant bits of metal into just the right angle, usually 20 degrees each side. Use a lighter touch than you think, just a little more than the weight of the knife itself. Electric sharpener. Kitchen toy purveyors like Dillard’s and Williams Sonoma carry electric knife sharpeners that grind your knives to just the right angle with little to no effort on your part. I’m not sure this is worth the extra expense, but it is a viable way to get your knives sharp quickly. Whetstone. The stone is the professional standard for sharpening. It takes a steeper learning curve and more time than the other sharpeners, but the result is more even and removes less of the blade. It requires the user to hold the knife at just the right angle while drawing against the stone. Again, this is usually 20 degrees, but it’s sometimes different depending on the type of knife, a situation in which a DIY option is better. Professional sharpening. If you just can’t find the time or don’t want to purchase anything, there are several retailers who are glad to do the sharpening for you for free. In central Arkansas, two I know of are Kreb’s and Williams Sonoma. But, of course, this is just a way to get you in the store so you’ll be tempted to buy more stuff, so it might be best to invest in one of the above! More another time on choosing a decent knife to begin with, and why that crappy santoku probably won’t hold the new sharp edge very long. How often do you sharpen your knives? Or have you ever done it at all?